Which Languages are Supported in Memsource? Memsource is a language-independent system. This means that we can support practically any language. If there is a language we do not currently support, we can add the support in just a couple of weeks. 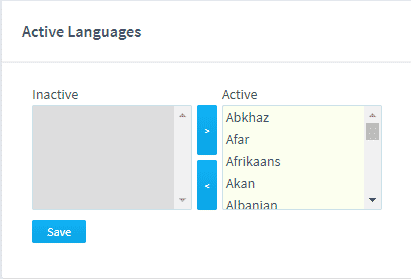 When you select source and target languages, you are only offered languages that are set in the system as "active". Languages can be activated and deactivated under Setup by going to the Administration section and clicking on Active Languages. Memsource offers an embedded spellchecker, which supports most of the major languages available in Memsource. This is the full list of languages supported by Memsource spellchecker. In Memsource Editor, go to the project that you plan to spellcheck. Check the box in the left column to activate the buttons above. Click Download then Bilingual MXLIFF. Open your document, run the spellcheck, and do not forget to save the file afterward. Return to your Memsource project and click on Tools then Upload. After the upload, open your job in Memsource Editor and confirm all the segments that are not already confirmed (e.g. by using the Filter function).